I currently work in Northwest Florida, which in many ways is the polar opposite of Alaska. Our Gulf doesn’t have majestic marine ecosystems littered with unique marine mammals and diving sea birds. We don’t have grandiose mountains and glaciers. And the only ice you’ll find in our waters is from our beer coolers. So when I told people I was returning to Alaska to attend the Alaska Marine Science Symposium, many people asked what benefit it was to me. It’s not the ecosystems I currently study, nor the species. Why bother? The answer is simple, science is science. Knowledge is worldly and in a time when the challenges facing the marine world are global, it is imperative that we approach it from a universal perspective. The unique setup of this conference that Arina already touched on in her blog, lends itself to thinking outside the box and on a much broader scale. Because it touches on all aspects of study (e.g. oceanography, lower trophic levels, birds, mammals, fisheries, ecosystems and human dimensions) it becomes easier to see overlap between difference sciences and geographic scales. This is exactly what my research lab at Florida State University tries to achieve – cooperation across disciplines. For me, this conference and the presentations were useful in that it helped me see how we assess similar metrics in different ecosystems while simultaneously teaching me the latest methods and technology. On the first day, and much to my surprise, seagrass was the focus of student Wendel Raymond’s talk. For the past year I’ve been so immersed in the seagrass habitats of Florida that I totally forgot seagrass existed elsewhere. His research was interesting in that it took the well-known story of the top-down effects the removal of sea otters, a keystone species, had on kelp and applied it to the local eelgrass community. Long story short, when sea otter populations declined, we also saw the decline of kelp habitat. 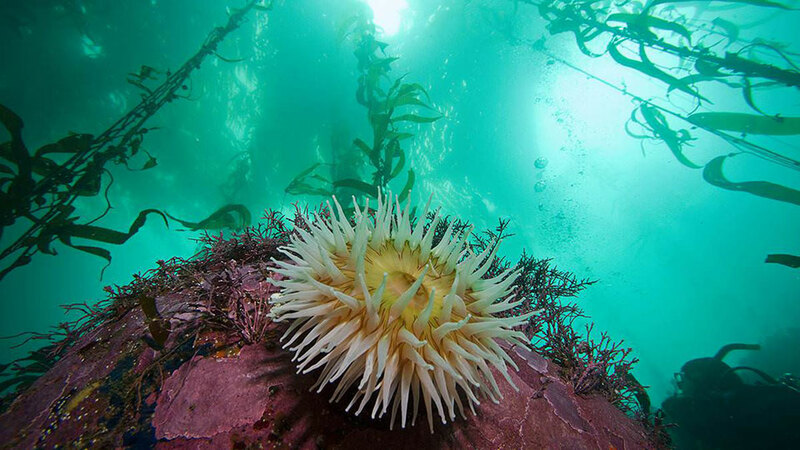 This was because grazing species, such as sea urchins, that sea otters usually keep in check through predation, were able to rise up like Skynet and destroy swaths of kelp forest. Extending this principle to seagrass habitat, Raymond examined the potential of a trophic cascade by investigating the indirect effect sea otter presence or absence may have on eelgrass biomass. The hypothesized cascade is that lower sea otter abundance would increase crab and fish populations (a common prey of sea otters) which would in turn lower grazing animals (these grazers are considered epiphyte grazers) which would then increase ephiphyte abundance (ephiphytes are sessile organisms that settle on seagrass blades) which in turn would result in epiphytic fouling of the seagrass, thus lowering seagrass biomass. Raymond found strong support for these relationships, though not all the links in the cascade were shown to have a relationship (e.g. they found no evidence that crab and fish were related to epiphyte grazers). 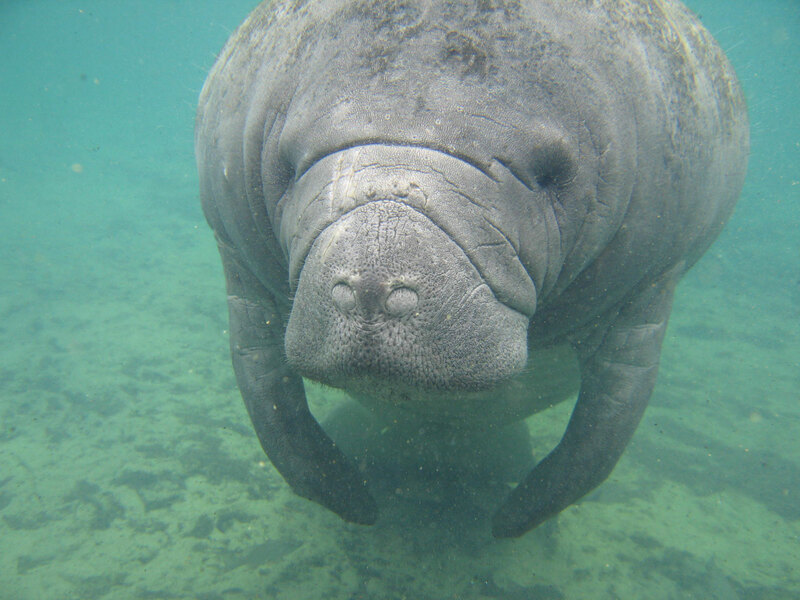 Seagrass beds in Florida Keys National Marine Sanctuary are home to manatees and other species that may serve a similar role as sea otters do in the North Pacific. For our work in Florida, while we have not specifically looked into trophic relationships, it could be interesting to look at how these trophic relationships function in our local seagrass habitat. Even possibly seeing if there are crucial species, possible large grazers such as sea turtles and manatees, that would affect seagrass biomass with their removal from the ecosystem, and thus causing a trophic cascade. A main focus of my work in our lab is looking at ways of measuring biodiversity. So one of the talks that stood out to me was by student Lauren Sutton that compared the functional diversity between two Arctic systems. Functional diversity is slightly different than your traditional biodiversity metrics such as species richness (i.e. the number of species present in an ecosystem). Rather, it focuses on how species contribute to the ecosystem. The researchers of this study hypothesized, that epibenthic invertebrate communities may have higher resilience to the effects of climate change based on their higher functional diversity and functional redundancy. Marine Biodiversity is directly linked to ocean health. Because of this talk, functional diversity is now on my radar as a possible next step in our study of the biodiversity of kelp communities in the Channel Islands. Understanding the roles unique species play in the ecosystem and if those roles overlap, gives researchers a better grasp of how a community functions and how it will be affected by the confluence of pressures such as ocean warming, overfishing, pollution, and ocean acidification. All in all, travelling to Alaska to attend this conference was beneficial, interesting, and gratifying. From early morning presentations to evening poster sessions to late night theoretical discussions, the whole experience was valuable. I am grateful that the research team I worked with while at the Alaska SeaLife Center saw fit to bring me back to AMSS for a second year.